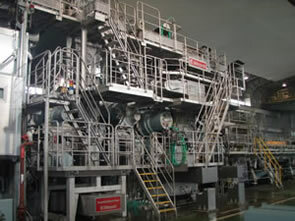 PAPER MACHINERY｜Kobayashi Engineering Works., Ltd.
FORMER SECTION Based on both our independently-developed technology and world-class technology, under technical license　with leading paper machinery manufacturers in USA, we could offer you state-of-the-art headboxes and formers, applicable to all grades of paper and paperboards. 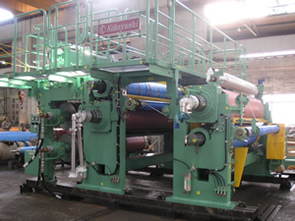 PRESS SECTION We could offer you excellent sheet quality and highest dryness at outlet of press section with optimized press configurations suitable to each paper and paperboard grade. Our press concept is based on GSP (Gradient Soft Pressing) theory which has been exclusively developed by continuous investigation and analysis of various experience. 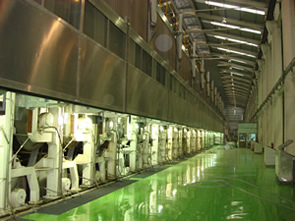 DRY SECTION We could offer you not only high drying capacity, but also high over all paper machine efficiency, with sophisticated equipment and device, associated with dryer part and its auxiliary equipment. Our total engineering materializes the expert knowledge of “drying papers” into tangible forms. 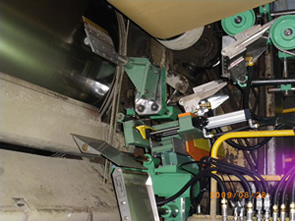 DRYEND We could offer you the advanced paper finishing equipment from calender to cutter after dryer part with optimized engineering. 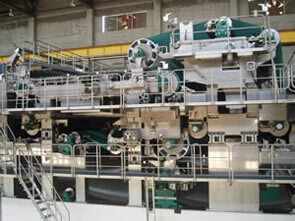 AUXILIARY EQUIPMENT We could offer you the auxiliary equipment such as automatic paper threading system, cleaning & conditioning systems for paper machine implements. Also offers machinery diagnosis service by certified technical specialists, including total machine vibration analysis service.